Lets talk about Fall since it is here. The number one thing that most people stop doing when this time of year comes round – getting outdoors. 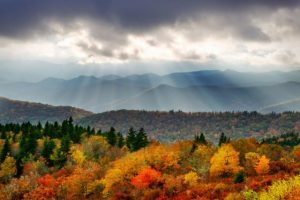 Bright blue and sunny skies, freshly fallen leaves, trees painted in bright colors and the hills around Asheville covered in amazing colors – how could you not be drawn into spending more time outside making the most of the amazing scenery? While most of us put our walking boots to the back of the closet the minute that summer starts to fade, what if I told you that taking a gentle stroll in the Fall has a great impact on your health, and can even lift your mood and fend the ‘winter blues’ despite the darker evenings drawing in? There are many reasons why I’m so fond of walking, but two easy one’s are that you don’t have to move at a fast pace like running, and it’s very unlikely to cause any injuries that put you out from doing what you love. You don’t need any equipment (like with most sports/activities) and it’s the foundation for good healthy habits. What do I do when I need to get away from a stressful day? I go for a walk! Preferably surrounded by nature and it is even better with my dog. For some it’s a walk around a lake or downtown. For others, it might be the woods or even a park. Going for a walk anywhere in a natural setting is going to help reduce your stress levels. Believe it or not, walking is actually good for your mind and overall mental health. According to a study, people in their 60’s, 70’s, 80’s and 90’s who walked more than a quarter of a mile a day had half the incidence of dementia and Alzheimer’s disease. It might seem pretty obvious that exercise can help you build, and tone your muscles, but this especially holds true when it comes to walking. Walking helps tone up legs, butts and bellies– just be sure to be aware of your posture that you’re not slouching over, and your head is held up high. Keep Moving No Matter What Age! Walking (no matter what age you are) can help you stay mobile and independent even in your 70’s and beyond! It keeps your joints moving so they don’t seize up, and your body strong – reducing the likelihood that you’ll be affected later on in life with something like knee and hip pain. Way more than you think! Brisk walking raises your heart rate, helps you get fitter, and keeps you from feeling tired less quickly. If you walk briskly for just 30 minutes, you can burn up to 150 calories – which is equal to the number you’d burn playing doubles tennis for the same length of time. And it’s more than half the number of calories in the average chocolate bar! Although the exact number you burn depends on your body weight, age and fitness, there’s no denying that walking more is a good thing. There you have it, 5 reasons why you should keep active this Fall and explore more of our amazing area with walking. Keep active all year round, by the time the warmer months come round, you can keep active for longer without risking any injuries, or slight twinges dampening your day. P.S. For more tips on Healthy Habits, check out our blog! P.P.S. If you have any trouble with implementing the above information, give us a call, we can help!